Malala's father, Ziauddin Yousafzai, spoke with VOA about why his daughter connects with so many people. "It’s really maybe the purity of her heart, the purity of her intentions, the purity of her cause that she stands for education and especially for women’s empowerment through girls’ education," he said. "And that cause is so sacred and it connects her to girls and adults around the world. "Many old men, old ladies, they love her. This is something you can’t explain in words," he said. "I see this connectivity between Malala and the rest of the world. We receive every day, every week, bundles of school projects on her. We receive many notes from many parts of the world, Far east to Africa." Ziauddin also shared some tips. "I don’t have much to tell the world about parenthood or about mentorship. Usually I tell two simple things: number one, we should believe in our children and listen to them. Usually we adults don’t listen to them. Ours or others. "Most importantly, I used to listen to my children. I still listen to them very carefully. Number two: appreciate them, value them, realize they are worthy, significant, very important. Then they believe in themselves. And number three: I say to the patriarchal societies, to the fathers and brothers — ask me what I didn’t do — I didn’t clip her wings. That’s so simple. We don’t have to do anything more. We don’t need to do anything extra. "Simple thing is we should believe that half of our population are women, they have the same rights we have. They have same intelligence, smartness and wisdom that we have. And they have the same equal rights that we have — once we believe they are amazing," said Ziauddin Yousafzai. He spoke about what he sees on the horizon. "The Fund is doing fantastic. I didn’t imagine that when we started this fund in 2013, we were just three to four people. Now it has more than 30 staff, it has a lot of budget and it is working in many countries. 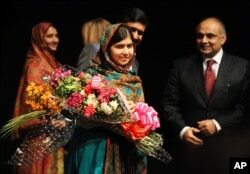 The focus is on girls' education, secondary education," he said. "Malala has been working very effectively through her fund — for the Syrian refugees. We’ve been to Jordan twice, to Lebanon once. She’s opened two schools on her birthday in 2016 [in Lebanon]. The fund is doing very well. Especially, our strength lies in advocacy. We can’t send every child to school — we don’t have that billions-of-dollars budget," said Ziauddin Yousafzai. "But Malala’s strength and her voice is very effective to demand from world powers, from the governments, to invest more on education, rather than in investing on wars and ammunition, and tanks and guns," he said.